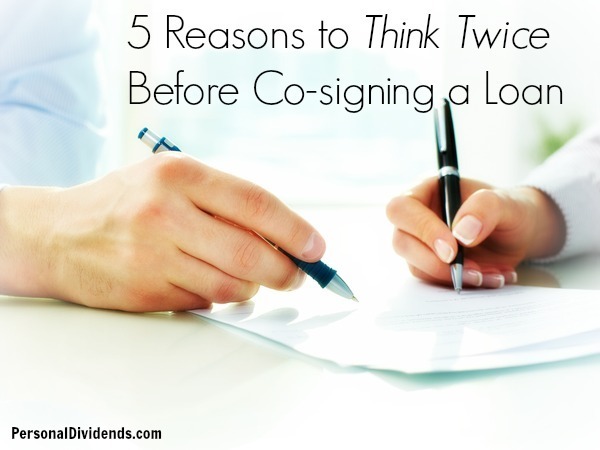 Unless you actually work in the lending business, you may think of co-signing a loan as being a casual arrangement. It is something that you will do for a family member or friend in order to help them establish credit, rebuild credit, purchase something they truly need, or just to get through a rough patch. But before co-signing a loan for anyone, first consider the following five possible outcomes. One or more may cause you to re-think the whole idea. Because your name is associated with the loan, it will turn up in your name as your liability on a credit report. Often, it will not be indicated that it’s merely a co-signed loan, rather than a primary obligation. Because banks look at total credit outstanding, as well as debt-to-income ratios, the co-signed loan could prevent you from getting additional credit. Alternatively, you may still get additional credit – but at less favorable terms. Even if you show the bank that it is a loan you merely co-signed, the bank will still see it as a contingent liability, and continue to consider it as part of the overall loan decision. If your own finances or credit situation are already tight, you should avoid co-signing a loan for anyone. Because the loan will show up on your credit report, a delinquency will be reported as a result of the primary borrower making a late payment. That will affect your credit scores in a negative way. It does not matter to the credit repositories that you are not the one who made the late payment – they will simply report it as a late payment on a loan that you are responsible for. Whenever someone needs a co-signer in order to get a loan it’s because there are one or more weaknesses in their own financial profile that a lender doesn’t like. It is entirely possible that these weaknesses may cause the primary borrower to default on the loan. You cannot dismiss this outcome simply as the primary borrower’s problem – since you co-signed the loan, the default or collection action will be reported on your credit report as well as the primary borrower‘s. A credit hit of this magnitude could cause your credit scores to plummet, and reflect negatively on you. Once again, this could interfere with your ability to get loans in the future. A credit hit is not the worst outcome should the primary borrower default on the loan. In this situation, the lender will come after you for the amount of the deficiency. That is the entire reason that they have you co-sign a loan the first place. You, as co-signer, are the lender’s ultimate security in the event of default. They will expect you to honor any portion of the obligation that the primary borrower is unable to pay. And even if you are able to payoff the obligation completely, the negative performance of the loan will remain on your credit report for years to come. Though this may not seem fair, it will represent a default of a loan that is in your name. In a default, the lender and the credit reporting agency will make no distinction between you – as co-signer – and the primary borrower. If a co-signed loans blow up the damage can be more than just financial. Since the default of the loan will hurt your credit standing, and even your bank account, it will be difficult to avoid hard feelings over the event. This can have the potential to destroy what was once a cozy relationship. While it is often said that blood is thicker than water, money can often play a spoiler role in relationships. If you lose money, or suffer some other form of financial damage, as a result of the actions of a loved one, it could change your view of that person. As well, the person who you co-sign the loan for may be so overcome with feelings of guilt about the outcome, that he or she may even avoid contact with you. In some extreme cases, they may even blame you since your co-signing the loan allowed the entire unhappy event to happen in the first place. That may sound like convoluted logic, but it’s what can happen when blood and money produce an unfavorable outcome. Co-sign a loan for a family member or friend if you feel it is the right thing to do. But just be certain that you consider the possible fallout if things don’t go the way everyone expects. Have you ever co-signed a loan that didn’t have a happy ending?